Grant that your people, we pray, almighty God, may be ever watchful for the coming of your Only Begotten Son, that, as the author of our salvation himself has taught us, we may hasten, alert and with lighted lamps, to meet him when he comes. Who lives and reigns with you in the unity of the Holy Spirit, one God for ever and ever. Behold thou shalt conceive in thy womb, and shalt bring forth a son; and thou shalt call his name Jesus. He shall be great, and shall be called the Son of the most High; and the Lord God shall give unto him the throne of David his father; and he shall reign in the house of Jacob for ever. And of his kingdom there shall be no end. And Mary said to the angel: How shall this be done, because I know not man? And the angel answering, said to her: The Holy Ghost shall come upon thee, and the power of the most High shall overshadow thee. And therefore also the Holy which shall be born of thee shall be called the Son of God. (Luke 1:31-35). Today the feast of St. Virginia Bracelli is celebrated in Italy. She was born in 1587 and entered into an arranged marriage in 1602. She bore two daughters and was widowed in 1607 aged 20. She refused another marriage and took up a vow of chastity. She devoted the rest of her life to helping the needy and the sick and died in 1651 aged 64. She was canonized by Pope John Paul II on May 18, 2003. When we celebrate Christmas we are commemorating the three nativities of Our Lord Jesus Christ. This is the reason for the three Masses celebrated on this day. The first is the eternal begetting of God the Son from all eternity within the mystery of the Blessed Trinity by the Father, “You are My Son. Today I have begotten You.” This first nativity was before the seven days of Creation, when everything was darkness. This is why the first Mass is at midnight to recall the darkness that prevailed during that first eternal birth of the Second Person of the Blessed Trinity. The second nativity, or birth, of the Second Person of the Trinity is commemorated on Christmas day when He became man, born of the Virgin Mary, in Bethlehem. For the world, the darkness was beginning to be dispelled. This is why the second Mass is celebrated at dawn when the dawn is beginning to dispel the darkness. The third nativity of Christ is when He is born in our souls, through His in-dwelling, when man, through grace, becomes enlightened. Thus the third Mass is celebrated during the day when the sun is bright. For man is truly enlightened when he has Christ in his soul. The first nativity reminds us of the Spirit of poverty, the Spirit that tells us that all the things God created is His, to be used for His glory and not for man’s enjoyment. Even man was to use himself for the glory of God. This represents the six days of creation. If Adam, being the head of creation, had observed the spirit of poverty and used all of creation for the glory of God, then he would have entered into the Sabbath, God’s rest… i.e. eternal happiness. But Adam messed up everything. And the consequence: the whole of mankind could not enter God’s rest. 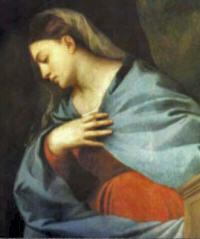 The second nativity reminds us of the Spirit of chastity. That Spirit reminds us to give up all physical comforts, pleasure and conveniences. And Christ in the manger is a clear example of this. It is a continuous reminder that true happiness can only be found in God and that we are on earth to seek God. All the rest will come with that find. True rest can only be found in God. Christmas reminds us of one lesson. Christ was born to die. For us the message is clear. We are born to die to oneself. And to die to oneself means reaching a point in our lives when we no longer do our own will but the will of the Father in heaven. This is to lose one’s life in order to find it. If we have learned the lessons of the first nativity, if we have learned the lesson of the second nativity, our reward is the third nativity, when Christ is born in our souls….indeed our eternal Christmas. This is truly a Merry Christmas. Daughter of Giorgio Centurione, and imposing and controlling individual who became the Doge of Genoa, and Lelia Spinola. Raised in a pious family, she felt drawn to religious life as a child. However, due to family position she agree to an arranged marriage to Gasparo Grimaldi Bracelli on 10 December 1602. He was a drinker, a gambler, and though the couple had two daughters, Lelia and Isabella, he was little of a father or husband. Virginia was widowed on 13 June 1607 after five years of marriage, aged 20, and with two small children. Virginia moved in with her in-laws, cared for her children, and dedicated her free time to prayer and charity. When her daughters were grown and married, Virginia devoted herself entirely to caring for the sick, aged, and abandoned children. In late 1624 and early 1625 war in the region led to many orphans, some whom Virginia took in and cared for, and she worked with refugees in the town. When her mother-in-law died in August 1625, Virginia poured herself into the work, turning her house into a refuge and founding the Cento Signore della Misericordia Protettrici dei Poveri di Gesù Cristo. Her house was overrun with the needy during a plague and famine in 1629 – 1630. To house them all Virginia rented the vacant convent of Monte Calvario and moved her charges there in 1631. Due to crowding, extra housing was built in 1634, Virginia was soon caring for 300 patients, and in 1635 she received official government recognition for her hospital. Virginia worked closely with the young women in her houses, teaching them religion and ways to earn a living. The expenses of Monte Calvario were excessive, so Virginia bought two villas and started construction of a church dedicated to Our Lady of Refuge. It became the mother church of the Institution, whose Rule was written between 1644 and 1650 and which was divided into two congregations: Suore di Nostra Signora del Rifugio di Monte Calvario (Sisters of Our Lady of Refuge in Mount Calvary) and Figlie di Nostra Signora al Monte Calvario (Daughters of Our Lady on Mount Calvary). When the group of Protectors, the superiors and governors of the Institute was selected in 1641, Virginia retired from administration, working as the humblest sister, doing chores on the grounds and begging for alms for the Institute. Sadly, though the Institute was a success, healing the sick, educating children, training adults, and helping the dissolute return to productive lives, assistance, personal and financial, began to decline. Without the chance to work with Virginia, many of the middle and upper class did not participate, fearing the poor and rough residents. Though her health was failing, Virginia returned to active administrative duties. She worked for general spiritual development throughout the region, working for the choice of the Blessed Virgin Mary as patron of the republic of Genoa in 1637, for the institution of the Forty Hours’ Devotion in 1642, and the revival of home missions in 1643. She acted as peacemaker between noble houses, and aided in the reconciliation of Church and Republic authorities in 1647, ending a dispute caused by the government abandoning support of the Institute. Virginia continued working up to the end of her days, and in later years received the gifts of visions and interior locutions.